White Creek is a right side tributary of the Hornád river. It has its springs at the height of about 900 m on the northern slopes of Geravy, surrounded by Holý Kameň (Naked Rock), Červená Skala (Red Rock) and Suchý Vrch (Dry Hill) from the north. The water reservoir Klauzy is situated at the upper part of its flow. In past its water was used for floating the wood down to the Smižany village. In the White Creek, there end the creeks creating the ravines of Kyseľ and Sokolia dolina (Falcon Valley). Shorter canyons arose in the places where the White Creek flows through the limestone - mainly in the lower and middle part of its flow. Medvedia jaskyňa (Bear Cave) and Zlatá diera (Golden Hole) are situated in the eastern rocky slopes of the Gľac Plateau on the left side. 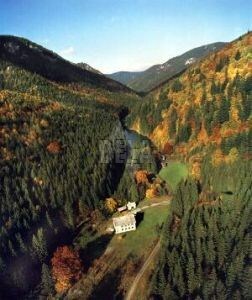 The major part of the White Creek Valley belongs to the National Nature Reserve Kyseľ. ACCESS: To the White Creek Valley you can hike following the marked routes from Spišská Nová Ves or from Dedinky. SURROUNDINGS: Čingov, Prielom Hornádu (Hornád Canyon), Tomášovský výhľad (Tomášovský View), Sokolia dolina (Falcon Valley), Kláštorisko, Kyseľ and Geravy.